Palm trees are pretty to look at, offer some shade in tropical climates, and also commonly leave fronds in the middle of roads. They are iconic, especially in summer months when the sun is shining and beachgoers enjoy rolling tides. However, there’s more to palm trees and fronds than being on postcards, tattoos, and advertisements. Fallen palm leaves are a popular resource now, and are used to make a variety of necessary products such as tableware. Palm trees are an interesting plant, and can be found in more varieties than many know. In fact, there are over 2,500 species of palm trees found in extremely humid and dry climates. The species itself is versatile, but it’s mainly know to be in tropical, humid environments. The commonality of palm trees in a variety of places helps push for the use of their resources, especially their fallen leaves. That’s right – leaves. Palm leaf tableware isn’t made from the tree’s wood; it’s made of the leaves that fall on the ground. Since these would otherwise go to waste, finding a way to use them helps create a more beneficial life cycle for these gorgeous trees. Palm tree leaves are a sustainable and durable material that replaces many other common resources, such as Styrofoam. Although many non-eco-friendly resources have been trusted in the past, especially in the restaurant culture, palm leaves may surprise many traditional users. Plus, using palm leaves in tableware is more sustainable and eco-friendly because it is derived from all-natural sources. Thus, when it is disposed and goes back to the earth, palm leaf products don’t bring any hazardous chemicals along, unlike Styrofoam. Polystyrene foam, also known as Styrofoam, is detrimental to the environment on many levels. In addition to the long time it takes to break down (approximately 500 years), polystyrene foam also releases hazardous gases into the air if burned. Thus, there is no easy way to dispose of these harmful material. Just like our other collections, our palm leaf plates and bowls are very friendly to the environment. Since this tableware is made from fallen palm leaves, no trees are cut down in the process. This also makes palm leaf products a more sustainable option than other tableware because no nonrenewable resources have to be used. On the other hand, we have to use petroleum and other resources to create Styrofoam. 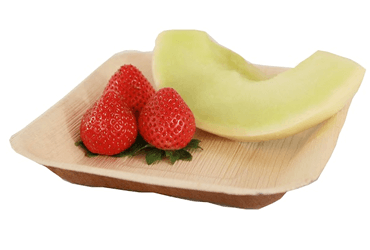 Each palm leaf plate and bowl is made from 100% organic material and are also biodegradable. Thus, they are easier on our landfills because they break down quicker than other materials. Lastly, palm leaf tableware doesn’t excrete harsh chemicals into the ground or atmosphere during their biodegrading process. This helps alleviate some of the detrimental effects of global warming. Every customer will love the look and feel of our palm leaf tableware because not only are they gorgeous, but they are also resilient. 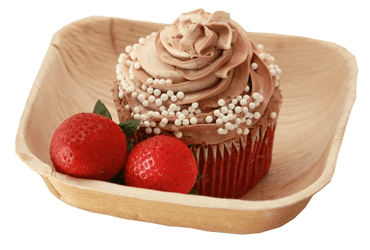 Our palm leaf plates and bowls hold many types of meals, such as heavy burgers, fresh salads, fruit assortments, and many other gourmet treats. 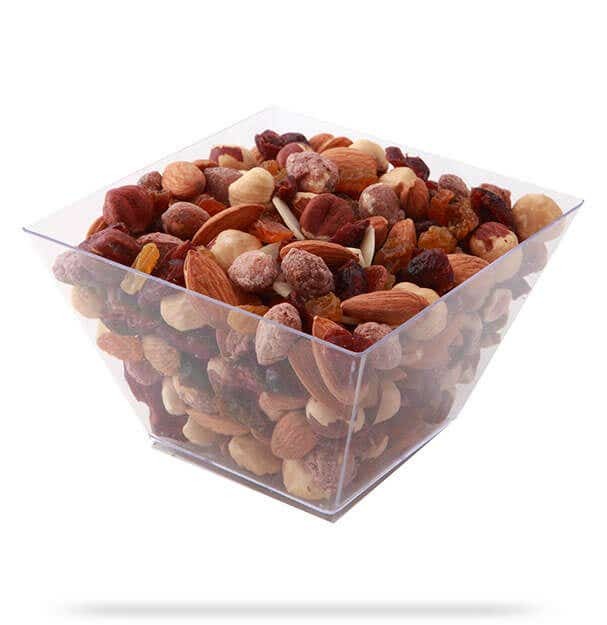 You won’t have to worry about our plates and bowls tearing, ripping, or bending while your customers enjoy their meals. Each bowl and plate is specially made to be durable, and your guests will surely love the quality of this disposable palm leaf tableware. 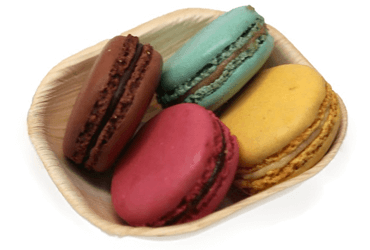 At Restaurantware, we want to provide the most green, yet functional, tableware available. We search across the world to find innovative solutions to reducing the restaurant world’s carbon footprint. Thus, we found that palm leaves – collected after they fall naturally – can be turned into fashionable, eco-friendly, and durable tableware. Palm leaves are already beautiful, it only makes sense that they are turned into the base of your table settings. Minimal chemicals are added to palm leaves once they are made into products, so you can be sure that no chemicals come close to your food. Also, palm leaf tableware has no flavor transfer, so your customers can enjoy their food without any interfering taste. Our palm leaf collection is so supreme that your customers won’t even realize that they are disposable. Everyone will want to continue using these plates and bowls, so make sure to keep them in stock. Although our palm leaf plates and bowls are pretty and strong, they are only designed for one-time use. However, they come many in a box, so you can be sure to always have enough. 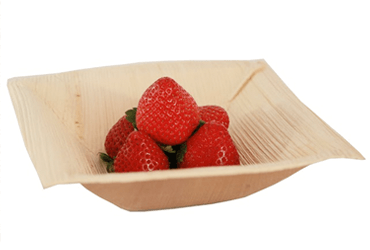 Using our disposable palm leaf plates and bowls will reduce your cleaning time without harming the environment because they are compostable. Palm leaf bowls and plates are the answer to your every worry about disposable tableware. We have many different shapes and sizes of palm leaf bowls and plates to suit your specific needs. You can either serve an appetizer, entrée, or dessert on our palm leaf collection. Mix-and-matching our palm leaf plates and bowls is the perfect way to add a creative and personal touch to every table. These plates are perfect for any food establishment whether you run a catering business, café, bakery, or food truck. You can surely find the perfect place for our palm leaf plates and bowls in your business. At Restaurantware, we aim to bring you the most fashionable, modern, and eco-friendly tableware available. Our palm leaf collection is a great example of the innovative tableware we try to bring to your tables. This collection is very versatile, so you can surely find a perfect place for them in your business. We sell these fabulous products to chefs all over the world, so don’t hesitate and get up-to-date by ordering palm leaf tableware. We will gladly deliver them right to your door, so you don’t have to run around town trying to find the best plates and bowls.